I wrote an article on my Staffrm Blog about how I use Mail Merge. I wanted to share that here too. “There came a time, possibly in my second or third year of teaching, where I wanted to give more specific feedback to students following an assessment. Maybe it was a Year 11 mock exam or something. Anyway, it prompted me to learn how to use Mail Merge on Word and it’s become a bit of a life (and time) saver for me. I am entirely confident that it adds value to how I feedback to my students, and how they buy in to the whole feedback process. It requires students to complete revision resources as an action following their review and it can be used to give them very specific feedback about areas that they have done well in and those where they have gone a bit awry. As you’ll see at the bottom of this post, I’ve also built it into Parents Evenings. I handed each student a sheet and got them to write out the mark they achieved in each individual question and sub-question. I could have these input into an Excel file and create a generic Word document that I could Mail Merge all of their marks into to give them each an individual sheet. This has evolved considerably – I do it now for each assessment. The banner above shows an image from one end of topic test where, to save time, I have avoided going into sub-question depth. For mock exams, where the stakes are higher and students tend to spend more time examining their performance and looking to improve, I do go into the sub-question depth. 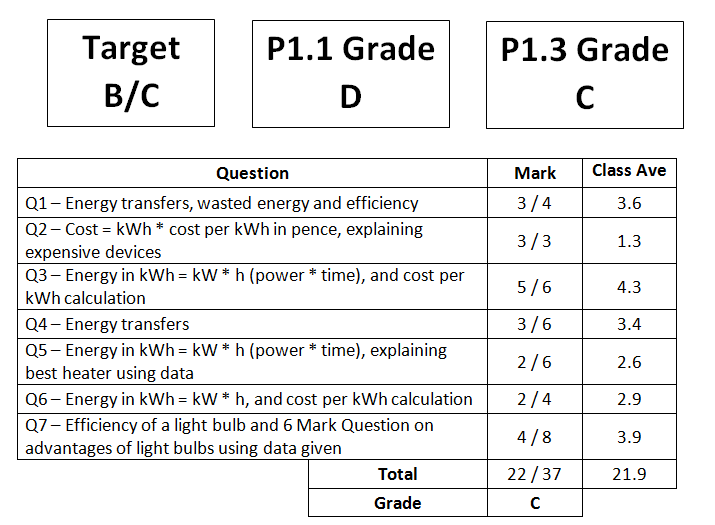 Once a student has looked through – and it includes average assessment grades from the class on each question to compare – they decide on two or three areas to do some revision on. This is indicated on the sheet and they have to produce a physical resource, or answer some additional exam questions, with a specific deadline. It’s been wonderful so far, and has been a work in progress over the years that I have gornw to use more and more. Follow this link to have a look at a few examples – feel free to steal them! Recently, I’ve used it as an opportunity to give personalised feedback to students and parents during Parents Evenings. Parents have commented on how useful it is, and it can help direct some discussions (though I do prefer to have discussions without the data first – the students approach, attitude and love of the subject is the most important thing). I also have students self-mark themselves on a set of criteria about their attitudes inside and outside of lessons, and they do it in front of their parents.